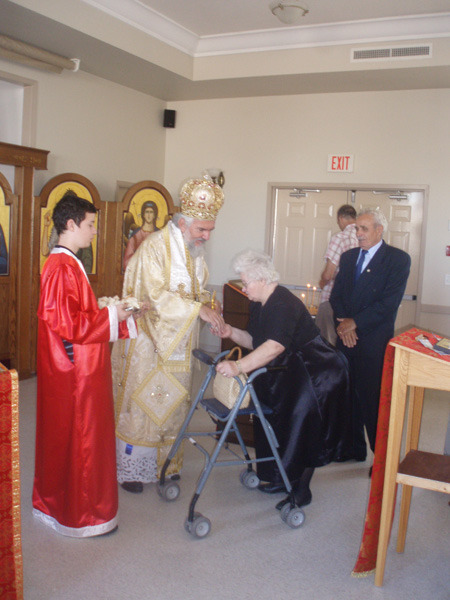 Kelowna, BC - The St. Elijah the Prophet Serbian Orthodox parish in Kelowna, British Columbia festively celebrated their Church Slava. As in previous years the celebration began on Saturday, July 30th with the traditional folk festivities "Serbian Days" in the beautiful Stratchon Park on Lake Ocanagan. 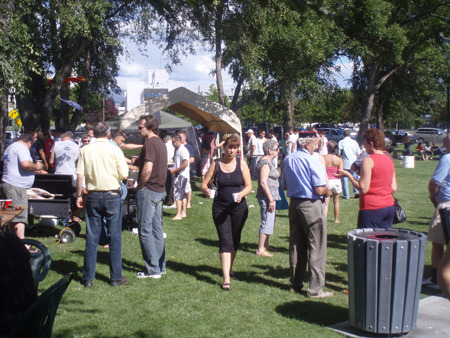 All those who attended, not only from British Columbia but Alberta as well, were able to enjoy the rich cultural, art and entertaining program together with many specialties from the Serbian kitchen as well as barbaqued specialties. 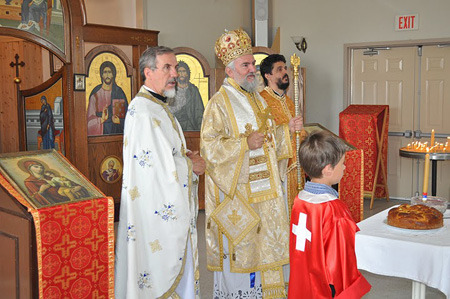 On the following day, Sunday, July 31st, the Holy Hierarchical Divine Liturgy was served in which His Grace Bishop Georgije of Canada officiated, with the concelebration of the Vancouver clergy: V. Rev. Stavrophor Miroslav Dejanov and V. Rev. Desimir Vidovic. Following the Prayer before the Ambon a Litiya was made around the church with the Gospel readings and sprinkling of the Holy Water. 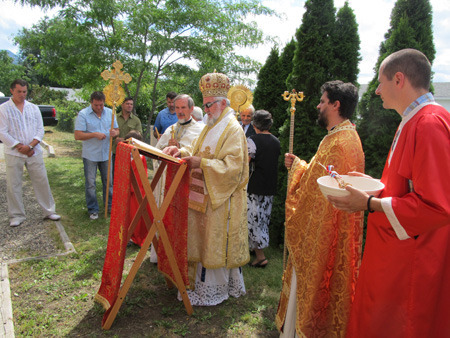 Everyone offered their prayers for Patriarch Irinej, Bishop Georgije, all faithful of the city of Kelowna but also the deceased founders and benefactors of the church with hope in the Resurrection and life eternal. 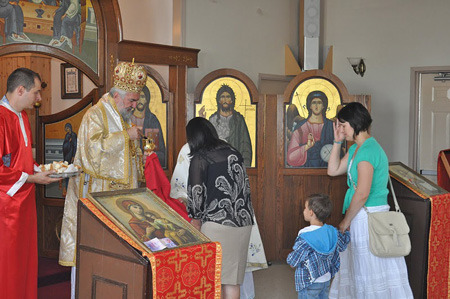 Following the Litiya everyone returned to the church where the Ritual of the Cutting of the Slava Kolach was served with kumovi Stacimir Kovacevic and his family. New kumovi, for next year's celebration, will be Predrag Knezevic. At the end of his homily, His Grace Bishop Georgije expressed his great spiritual joy that once again he can be with the faithful in this beautiful city and that with them he can celebrate their Church Slava. This year's Slava was finished with a formal banquet which was prepared through the efforts of the hard working kumovi as well as the members of the Kolo Sestara, "Holy Myrhhbearers".